Dofollow Backlinks ~ Grab a Quick PR8 dofollow backlink! 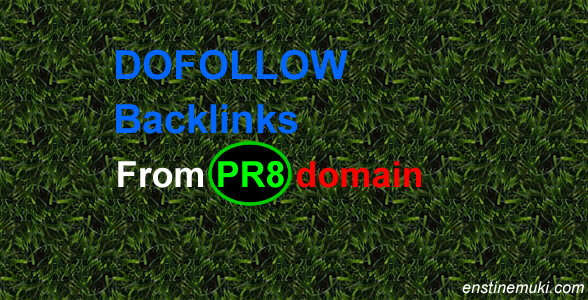 →Dofollow Backlinks ~ Grab a dofollow backlink from PR8 domain! Dofollow Backlinks ~ Grab a dofollow backlink from PR8 domain! You want dofollow backlinks for your site right? This is something I just discovered and I’m so excited to share this with you. By the end of this post, you will be able to do some little work and get powerful backlinks from a Page Rank 8 domain. The process is so simple to follow and it’s free. But then, what are dofollow backlinks? Before we discuss in details how to get your high pr backlinks, let’s clear some doubts. Dofollow Backlinks are simply links pointing back to your site from other sites without the rel=”nofollow” html link property. That means search engines are allowed to transfer page rank to your site from the site where the link is placed. It’s like a positive vote for you from the this site. Each time search spiders visit your site, they follow both internal and external links on your pages that don’t have the rel=”nofollow” tag. Each external domain you link to without this stop sign will be considered a recommendation by you. NB: You will be in trouble with search engines if you link to dangerous or suspicious sites without the stop sign. Read this post on how to keep your site clean and be free from Google ranking penalties. Backlinks from PR0 or PR1+? Generally, the more these backlinks, the better your search rankings. But here is the shock! This dofollow inbound links I’m talking about in this post will be created on a NOFOLLOW site. Yes! That’s what makes it crazy. Your content and links published on this site are all NOFOLLOW but I want to show you a little trick to insert a DOFOLLOW link in it. What’s the site? Must of us know storify.com. According to Wikipedia, it’s a social network service that lets the user create stories or timelines using social media such as Twitter, Facebook and Instagram. I’m not going to dwell much on what it is and what it’s not. I want to go straight to how to pick interesting dofollow inlinks or inward links or high pr backlinks from it. Here is proof that storify.com is PR8. You can find out for yourself by clicking here. Let me also prove to you that storify.com is nofollow. Take a look at this story I created some weeks back. Now you see from the image above that the link has the rel=”nofollow” tag. That means this link is nofollow isn’t it? It’s a stop sign telling search spiders don’t go any further. Don’t follow this link. Now let me prove to you that the same page has dofollow backlinks to my blog. That’s what this post is all about. The “Make money blogging” link points to my home page and “How much money can you make with a blog” points to this article. These are all dofollow inbound links. While you may want to still open the source code of this page and verify that, let’s use an SEO tool to find out. Go to Open Site Explorer and enter my domain name https://enstinemuki.com. Make sure you are on the “Inbound links” tab. You notice the filtering option in the image (1) Only follow. That means I’m only showing dofollow backlinks. In 2, I have the link from Storify.com and 3 is the anchor text. The second dofollow link “How much money can you make with a blog” has not yet been indexed this moment because I just edited the story. It should be within the next few days. How did I get these dofollow backlinks? Here is the exact steps to follow and grab your own dofollow high pr backlinks. Let’s start with getting the link to your home page. That of course will boost your ranking big time. Go to storify.com and create a free account (that’s if you are not yet a member). Note that I won’t be giving you details on how to use this platform. I’ll be going straight to how to get the precious backlink. Write an article of 500 and more words. The preview will show below. Just drag and drop in your article or story. That’s as simple as that. The link on this object will be dofollow from a PR8 domain. You also will notice that you cannot edit the anchor text (as of the moment of writing this post). That anchor text is the title of your home page. You can also enter the url of any post or page on your site. Any link you create within your story though will be nofollow while the links on this dragged and dropped widget will be dofollow (i.e. no having the stop sign). This is how it is on Storify now (time of writing this post) and I don’t give any guarantee that this will be forever. It may change the next day so take advantage of it now. Sign up to my list so you don’t miss the next post. It’s surely going to be quite impressive. If you like this article, do share it on social media to give me some more exposure. The sharing tools are just above this post. Thank you so much for sharing this. I am trying out at the moment. Charmie recently posted…5 HeartBleed paranoia you are still encircled with. Wow STORIFY is actually giving DoFollow Backlink, I wasn’t aware of it. Thanks a lot Enstine Muki to make me aware of it. Bishal Biswas recently posted…Do You Make These 7 Mistakes When You Write? Thanks for sharing this nice tutorial. Now I’m going to take benefit of it. Ankit Kumar Singla recently posted…Revealing 6 Tips To Increase Your Email CTR on Auto-Pilot! Thanks for providing such an awesome ways to get link form high PR domain, Enstine. This is an amazing post, indeed. I mean storify.com has been known to almost all for over a time now but the way you twisted the whole game to seek out this element to help all get all get this really important PR 8 DOFOLLOW back link is simply mind blowing. These types, if DoFollow, do certainly help a blog gain some real good authority in the eyes of SEs. Aha! What a fantastic post you made! Getting a dofollow links from 8 PR websites is more worthiness as compared to getting a links form PR 2 or 3 website. Thanks for sharing this awesome secret with all. Now I am going to add a link for my blog and add some dollars to my account to provide links to my client. It was kinda confusing at the start of article, but the real thing mentioned was at the end. Thank you! Will try it out. Wow PR8 DoFollow backlink. Thanks a lot for sharing this, I will try to get one for my site soon. Thank you for the great share.I will write article for the same site. Thanks for stopping by and dropping a comment Sarvesh and hope to see you here again. That was an awesome article to for making the link to be dofollow. Now checkout my post for getting backlink from facebook and do you know what ..? It is a dofollow backlink. this is very rich info you just poured out…. That was a great trick to get a backlink Enstine! You always share these kind of useful stuff which are beneficial to bloggers like me. Bunch of thanks man. Thanks for the tip. I intend on trying this a little in the day. Enstine Muki it works! Thank you very much for posting this information. Thanks for this fantastic post. I already shared it on Twitter and Google+. The funny thing is for me is that I have already been doing this and I embed the Storify slide on some of my blog posts. Specifically for transcribing the tweets of the Twitter chats I host. I guess I will keep doing what I’m doing. It’s always good news to know that I’m doing things to benefit my blog. Have a good day and I look forward to your next post. Like all bloggers, I too value dofollow backlinks! They are like elixir for us! And to get a dofollow backlink from a PR 8 site would be an offer too hard to resist! As promised in the title, you have taught us the method. And to be honest, the method is really easy and of course free, just as you said. I appreciate the fact that you revealed this information and made a good blog post based on it, to make things easier for visitors! Thanks to Kingged, where I found the link to this post. Will sure Kingg it there! This method is really working, thanks a lot buddy for sharing this wonderful method with us. Well dang Enstine, that’s a darn great tip. I have not been using storify but I sure will now. I appreciate you mentioning my poor little PR2 link there as well. It looks so darn small up next to a PR8 site. I hate it when Google bumps me back down, it’s so inflating ya know. That’s okay, I love my blog but hopefully it will be back up soon. I learned why shortly after that so all is good now! That’s really interesting though and I’m wondering how long it’s going to take them to figure out they messed up there. I hope a very long time! LOL!!! Great share Enstine, really great fine so thank you again. I’m enjoy weekend at home with my beautiful family 😉 Hope yours too is good! Oh heck yeah, I’ve been as high as a PR4… That’s when I did a lot of article marketing but those sites got his so I got bumped down to a PR2. Once I recovered I was back up to a PR3 where I was for a little over two years. This last change I got hit again because my hosting company changed my link path so Google couldn’t find all my pages so I got bumped back down to a PR2. I was SO mad. It’s just because I’ve been up and I KNOW I’m one of the good guys which really just infuriates me when something in the background happens that’s out of our control. That’s why I quit obsessing over it because as long as I know I’m doing the right things for me and my readers that’s all I can do. It’s probably something they definitely overlooked but good for us and thank you for sharing. I know you’re so glad to have them home so keep on enjoying them my friend. Thanks! First , searching a dofollow blog/fourm is a very hard and gaining a single doffollow backlink is getting more difficult . And bro you have made both jobs easier for many of us . Thanks a lot and keep guiding us . Thanks for sharing this post on social media and thanks for commenting. These are awesome to follow by a blogger. Before four or five years, it’s very hard to get backlinks, nowadays its very easy. Even it is easy, now we have to check the PR while getting backlinks. Thanks for sharing this tips man. The trick is not working for me.I tried to drag the element but it is showing just a sign with no option to add text or no anchor text. You won’t be able to add any text or do any editing. I mentioned that the linked text will be the title of the url you want to add the short text will be its description. Make sure you click on the little search button if the url preview does not show automatically. One again a Great Tricks is Indeed here by you. i am addicted to learn new and more from you so, today I get a Little trick to make Backlink from PR 8 . This entry definitely a hit and I’m heading to storify straight away…who wouldn’t appreciate a PR 8? You make my day Akaahan ! Nice one Enstine. I have been using storify for some time now and you can create mini posts there. Good idea. I think, you have taken the buy coffee idea from me, right. Nice, thank you Enstine. Appreciate it. I will put it to good use. I think having a donate or ‘buy me coffee’ button is a good idea on a site. Every now and then there will be a generous person who will be willing to buy you a coffee. Thanks for buying me one. Yes, paying for coffee is an awesome idea. But it depends on how people react. Enstine, surely deserves his coffee for this awesome trick. Backlink matters and a PR 8 site matters more. wow, it really works. As till now i was unaware from this kind of do-follow link. But here after reading your article i got the point. As today everyone struggles to get do-follow backlink from a high PR site. And you provided such a beneficial information about getting backlinks from reputed sites. Thanks for sharing such a lovely post. I’m right now targeting Storify. Can we see the url to your story page? Hello Enstine, actually i got excited after reading this, and i’m learning some more about Storify. I’ll put the url soon. Thanks for lovely feedback for my comment. I’ve just published a story there with a link embedded to my site’s homepage, but the embed link doesn’t seem to be appearing on the story page. Where’s it linked from? Can you paste the link to your story here let me take a look? Funny enough, i don’t pay attention to backlinks but at a time, i was obsess with my alexa ranking 🙂 . But now, i am hardly on pc so time don’t allow me to do much on my blog as i used to. Hello sir, I’m new to blogging struggling to build backlinks from few days, i learnt many things about backlinks through your blog. This is a nice trick to get backlink from PR 8. Thank you sir. This was an amazing article on getting backlink from a PR8 site. I going to grab it fast. Yes Enstine, I love this tip! :) Storify is free and it’s accessible for anyone. I’ll take avantage to it. Now the question is to know How to index the links of that. Thanks for this info. My site is a couple of months old and doesn’t have any rank. I desperately need this. Will try it tonight. Did you try it Mark? Can you share your story url with us here? Wow a very cool and easy way to grab a do fooloow backlink that too from a PR 8 site. Thanks a lot for this wonderful article. Thanks for sharing this effective way of getting do-follow backlinks from a high authority sites like https://storify.com/. I will soon implement with my own blog. We all know that to get dofollow links from high PR is very difficult. I will give it a shot. Thanks for the awesome tips, Enstine. Awesome trick to get dofollow link from a popular webpage Enstine sir! Sure, will try to follow your tips by creating a story to add in Storify. Keep sharing your unique tips! But you have shared a very good thing for a lot of people. Learning to expand links, creating social bookmarking site profiles, publishing elsewhere and then getting some backlinks in return, is a great idea. I’ll need to check if that profile link is do follow. However, I didn’t see it picked in site explorer. I think (like I read from Neil Patel) that the content surrounding your links is important. That’s why links from within content quickly get picked and add more value than profile links. Well, maybe it’s still to be verified. Is that it? All I have to do is go to storify.com and follow those 3 steps to get this as a dofollow? That’s so simple and yet powerful to do! I’ve actually never heard of storify but I will be visiting the site! Thanks for sharing and you have a bless week ahead! I was not aware of this. It’s really helpful Enstine. I am gonna try this for my blog. Getting a do-follow backlink from a PR8 site will really boost our rankings. Thanks again for your nice tutorial. Ravi Kumar recently posted…How to use Aweber with Genesis eNews Extended Plugin? It will increase my page rank and also increase my blog visiblity. Thanks for sharing these tips, I guess my hard efforts to find and increase good backs will decrease to some extent. Dude that was just Awesome! I just signed up and within ten mins was already writing my first post on there buddy! Would love your thoughts on it! BTW whats your profile link on there I cannot seem to find you! Thanks a million EM thats going into my bag on tricks! what’s the url to your story? I have been gone for to long! This is an excellent post. Hi PR sites are important and getting a backlink with simple steps like these make get them easier. Thanks for the share man. I’m headed that way now to check it out. I hope everything has been going well for you! Well, what can I say about this??? Just want to say that It depends on you How you can reward me? That is the great trick you shared. Now a days, its very difficult to get the dofollow backlink. Bloggers and other site owners are so scared of penalty that they give nofollow backlinks to even best content and authority sites as you have given to PayPal. So any tip like above is very valuable. Looking for more tricks like this. I hope you follow these steps and grab your own backlink. It’s quite easy to follow right? Hi Enstine, this is really very useful post to create high quality PR 8 backlink, generally probloggers dont reveal this type of tricks with newbies / fellow bloggers,thanks for sharing with us,i’ll try to get backlink from Storyfy.. I so like this post of yours, Enstine and definitely gonna follow it from up to down! 🙂 Thanks for all the great contributions you made in the Internet World and people are so getting benefited from it! Awesome Man !! Hope this Trick Will Help my Blog . Did you also care to check when this domain was registered and when was the last PR update? It will Surely help to Rank Our Site SERPs……. Getting Backlinks From A PR8 site will definitely increase our search visibility. Nice post and Thanks for sharing this tip with us. Backlinks are very important factor in blogging specially do follow and we all are trying to get more dofollow links as large as possible. I never used Storify.com but after reading this post. I will surely gonna give it a try. This post really gonna help many bloggers to increase their dofollow. sounds good i think i have to try this .. thanx for great tutorial bookmarked blog .. It was great to know that we can get dofollow link from Storify but it is not a PR 8 backlink because search engines takes that particular page’s page rank in account. Weebly, Webs, Yola, they are also PR 8 websites and can provide dofollow backlinks by default. Thanks again Enstine, I ‘ve finihed this process, but I embedded 4 different URL together at one of this process! Is it okey that those all 4 URL embedded will get a backlink or just 1 of them? Thank you for such a great information. My blog is new and I was searching for some good backlinks for my blog. I think this will certainly help me. Can you give a little guidance about backlinks to the newly created blog and website? I am using social media, but it was not that much helpful. This is an amazing news that Storify is giving dofollow links, it’s a kind of amazing news. Great Post Enstine. This is why visit your blog Often. I will definitely try out these things. A link from PR8 site is worth so much. I’m getting eager on trying this one! I didn’t know about Storify even. I guess I have to work more on social networking for my blogs. Thanks in advance for a PR8 backlink 🙂 I’ll do this now. Wow! means PR8 dofollow backlink now my blog can get a boost in SERP thanks! for it and for the tutorial. Although I was using it from a couple of months, I have not noticed the dofollow links. I checked it for the dofollow links and found that domain links in bottom section of the linked excerpt are dofollow. And the title links are still nofollow (in my case). I too checked your story for dofollow links and results are same. Only domain links in bottoms section are dofollow. Your stuff is always interesting and admirable. But unfortunately, this trick no more works. As I tried it but got nofollow link. I’m glad you make this post here. That shows how concerned you are about your readers’ success. I’m particularly value link from high pagerank. Do-follow and PR8, that isn’t a small thing. Thanks for sharing this insightful post, I really need quality backlink to my blog, I used to be very good at making things go viral, but now, I just can’t get thing running on my blog after the remodeling I did on it. I hope thing will change and I would have the love of Google back on my blog. Hi again, I think the rule has changed, I publish an article just now and the link shows “no follow” I guess they got tired of being the link father Christmas….lol. Amazing article thank you sir.very nice high quality article you have written in your blog. I am following most of your tips. Awesome share, I’ll have take my time and look into this. Will be coming back to work with this post. I am following this article from very long time now and must say this page is also ranking good in google for dofollow backlinks. And i am following your tips so that i can also get some useful backlinks that can help to improve my page ranking as well. Amit Rockz recently posted…How much does Kickstarter video cost? How did i missed this amazing article. I am reading this now. Really no one can write like. Thank You for such an amazing post sir. Having a PR8 backlink can really boost rankings as well as blog health too. I was really curious to know about the PR8 backlink source. I tries it but I giving no follow back link, I follow according to your method but only no follow. Please help me. This is really something fantastic one. It will surely reduce the struggle for dofollow backlink. Thanks for providing such an awesome ways to get link form high PR domain. This article is worth sharing, getting do follow backlinks is very difficult now a days. you have shared a very useful tip on creating high pr do follow backlink. And i think this is also the reason why you article is ranking high in search engines. thanks for this useful post! I agree with you, Get do-follow backlinks are very difficult now a days but Natural backlinks are most effect. whether they do-follow or nofollow. so always try to follow Google rules. That is pretty impressive on getting dofoffows off Storyfi. PR8 is what Microsoft is I believe. And there are only like seven or eight, PR9’s in the world. I will have to give this a try. These really old PR’s are pretty accurate. I looked at the rest of Storyfi’s ranking numbers and they all lined up why its a PR8. Good job, thanks for the advice Enstine. how to maintain the ration between the dofollow links and nofollow links? For example if have 100 dofollow and 100 nofollow, will it effect the ranking? Don’t worry about nofollow backlinks. According to Google, Google don’t follow nofollow link but get nofollow link from authority sites are effect so make both dofollow and nofollow backlinks. First of all thanks for this wonderful post indeed! I used this method but it give me no follow backlinks. As I said in my previous comment, I follow all your rules but it give me nofollow comment. Whats the reason behind this. Please guide me thanks in Advance. This article is worth sharing, getting do follow backlinks is very difficult nowadays. Hi Enstine, Great tips. I was search for this information on Google. Finally found here. will fallow these tips while build the backlinks. I had never expected that getting a PR8 backing would be so easy. Enstine you really rocks. This is a very great post. I and many other blogging folks has searched for this information on Google severally. Finally finding here on a plater is amazing. Certainly every blogger will follow these tips in their quest for building quality backlinks. good luck to you as you follow the steps in this post. Must say, excellent way to build your PR juice. Any more tips to get do follow backlinks for a new blog? I didnt know that one could actually manupulate their way to get do-follow links on no-follow specific websites which i avoid like the palgue most of the time because i feel it is a waste of time. Will this trick work on other websits like youtube and the likes? It didn’t work for me. My links are still no follow. Any help? I dragged and dropped but still it was no follow. This is a wonderful share. When most bloggers are sharing list of high PR Sites you have shared a real time experience with how to guide. Thanks a lot for your honest share here. Now I can say that this high PR8 dofollow is link is achievable for me as well. really thanks. I would say just one work : -very smart work. This is the smartest way to get couple of dofollow backlinks. This very good post… Nowadays getting one do follow link is harder than getting 1000 followers. I will follow your steps while building back links for my blog. Just that you know, I know what I’m talking about – on this post, on the main content, there are only “Read this post” & “this article” which are DOFOLOWS and the rest are nofollows. In my experience, very few famous sites now allow DOFOLLOW links any more. Hi, Thanks for your awesome trick. I tried to insert the url in the way you have instructed in your article but the link is showing nofollow. Not showing why this is happening. Tried multiple times but getting the same result. But the link in profile is dofollow. Thanks. i am currently concentrating on dofollow commenting because i like reading post about blogging and also at same time i can get backlink.i have neglected this since so many days but started recently only. You know, I’m not sure I’d worry too much in this day and age regarding do and no follow. Storify is a great way to syndicate and share some of your best content, even if the link was dofollow, it’s not going to make a massive difference, but regardless will help your link profile look more natural if your storify is of high quality. Wow nice post I will definitely give this a trial to boost my seo and increase my visibility online….wish you an happy blogging sir! Glad to see your valuable tips on how to get dofollow backlink from pr8 site which is very helpful to make the strong backlink for a site. I would like to know that what google give more proirity at this moment Pagerank or Domain Authority. I am bit confused about that. Thanks for sharing a great tricks to get the dofollow links for storify website. thanks its realy awesome tricks. You have shared very useful method here on getting a do follow backlink Enstine. Tons of thanks for this great source of do follow backlink. Just found this while searching for getting Do-Follow backlinks. Happy to see this post. Now a days Do-Follow backlinks is very hard to get and you made me easy from this post. Thanks for the awesome post. I’ll definitely try it out now and see.